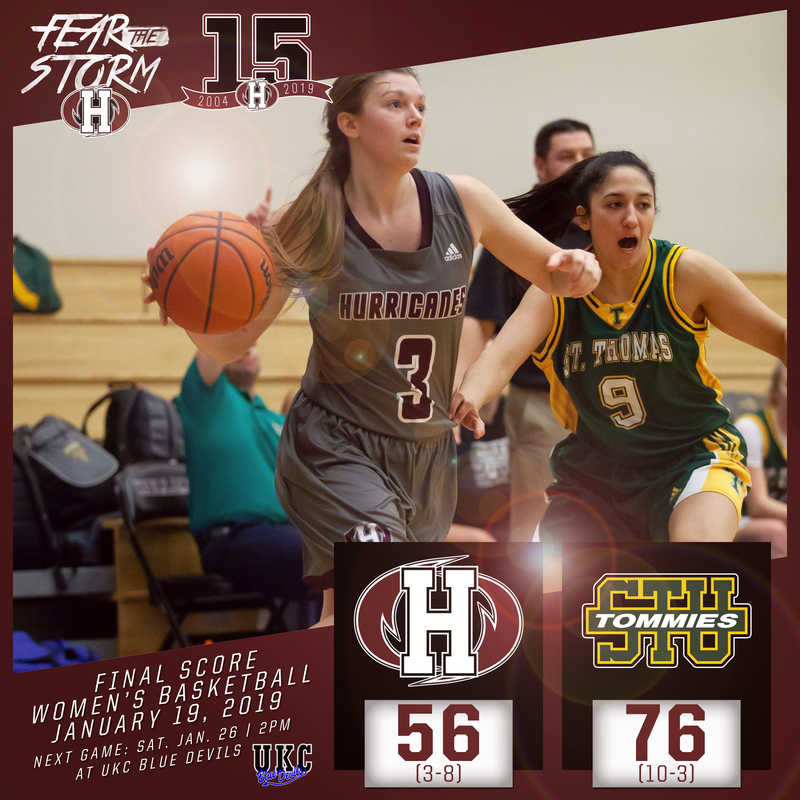 The Holland Hurricanes men’s and women’s basketball teams hosted the St. Thomas University Tommies on Saturday for a pair of games at the Holland College Centre for Community Engagement. The women would fall 76-56 while the men picked up a 109-80 victory. In the women’s game, the ‘Canes held a slim 17-16 lead after the first quarter but would relinquish the lead before the half; the Tommies took a 33-27 lead to the locker room. The game would continue to be close into the second half, with the Tommies leading 47-39 after the third. They would eventually pull away in the games final quarter to claim the 76-56 win. Lexi MacInnis led the way for the Hurricanes with 14 points, nine rebounds, three assists, two steals, and three blocks while Mae Smith added ten points and five rebounds off the bench. Kassandra Little and Sydney Goode chipped in with eight points each with Little adding six rebounds and four blocks. With the loss the Hurricanes fall to 3-8 on the season and are tied with the Crandall Chargers for sixth in the ACAA. The Tommies move to 10-3 with the win and are in second place. In the men’s game, the Hurricanes responded after some impressive three-point shooting by the Tommies early, leading 32-24 after the first quarter. That lead would grow in the second to 56-40 heading to the half. In the third, the ‘Canes would come out flying to extend their lead to 89-64 before the bench would take them home in the fourth for the 109-80 win. Roosevelt Whyley led the ‘Canes offense with a game-high 26 points while adding four rebounds, five assists, two steals, and a block. Two other Hurricanes players scored over 20 points with Jace Colley recording 23 points, six rebounds, seven assists, two steals, and two blocks and Travis Adams adding 23 points, 16 rebounds, three assists, and three steals. 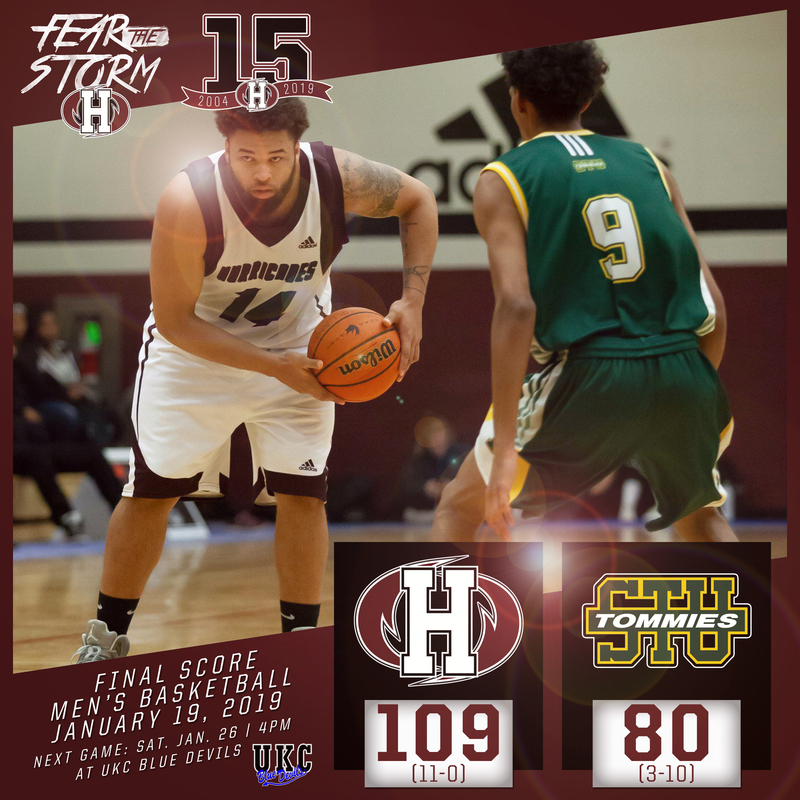 Jordan Holness and Connor Therrien both reached double figures in scoring with Holness scoring 13 points, seven rebounds, ten assists, and six steals while Therrien had 11 points, three rebounds, two assists, and two steals. The Hurricanes move to 11-0 on the season and continue to sit atop the ACAA standings. The Tommies are in seventh with a 3-7 record. The men’s and women’s basketball Hurricanes will return to action on Saturday, January 26 when they visit the UKC Blue Devils in Halifax, NS. They will finish this weekend with a road game in Truro, NS versus the Dal AC Rams. The ‘Canes next home game takes place on Saturday, February 2 when they host the MSVU Mystics at 2 and 4pm (w/m) at the Holland College Centre for Community Engagement. For more information on ACAA basketball visit www.acaa.ca. To connect with the basketball Hurricanes, visit www.hollandcollege.com/athletics, www.facebook.com/hollandhurricanes, www.twitter.com/hc_hurricanes and www.instagram.com/hollandhurricanes.